Hockey is a central theme and connecting link to major events in Doug Rigler’s forty-six years and he has high praise for the influence of coaches during his hockey journey. Skating was recommended as therapy to overcome a childhood physical disability and it worked. From skating to hockey was simply a matter of putting a stick in Doug’s hand and with the quiet, “lead by example” of his Dad’s coaching style he was on his way. Playing Junior B Hockey with the Home-town North Stars coaches reported that he was an unselfish, responsible two-way player who took pleasure in setting up a teammate as much as he enjoyed scoring. As a North Star, he distinguished himself as Rookie of the Year and MVP establishing a scoring record of fifty goals in fifty games. At season ending ceremonies, Doug accepted his awards from another “fifty goals in fifty games” performer, Bobby Hull. At age seventeen Doug left home to play in the AJHL where he became an immediate sensation. He played on a line with Brent Sutter and they won the Centennial Cup. Doug was Rookie of the Year, voted most sportsmanlike player, and was named to the AJHL’s All-Star First Team for both the regular season and the championship series. His statistics, 107 goals and 86 assists for 193 points placed him in the company of NHL greats Dany Heatley, and Mike Comrie. He continued to excel as a player in the Alberta Junior Hockey League (AJHL) first as a Red Deer Rebel and for two years as a Lethbridge Bronco. In Lethbridge a certain NHL career was curbed by a serious injury. Against all odds and a remarkable recovery, Doug enjoyed another six years in the minors. 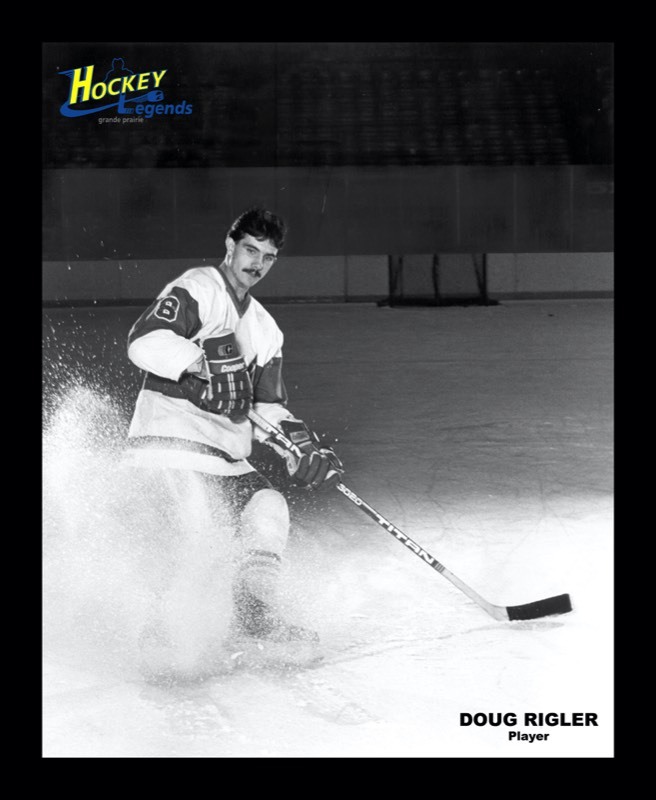 Following his last season in Lethbridge Doug was invited to a Washington Capital’s Camp as a free agent and in 1982 was assigned to their farm team, the Fort Wayne Komets in the International Hockey League. There, for the third time in his career, he was Rookie of the Year. He retired from professional hockey in 1987 at the age of twenty-six after another injury but not before he was recognized as Komet Center of the decade and chronicled nineteenth in their all-time scoring record despite early retirement. Doug reports that coaches: his Dad, Lorne Radbourne, Marv Bird, Ken Head and Don Chapman were particularly influential in his development. Ken preached that, “This is only a game and do your best every time you are playing but enjoy it while you can because it will end before you know it.” It was also Ken who taught Doug to beware of excessive partying. “A beer”, said Ken, “is the equivalent of eating a sandwich.” Henceforth the team adopted the term, “barley sandwich” as their moniker for beer. Doug reports that Don Chapman was his coaching role model. It was a model he has incorporated into his own coaching style. Doug is eternally grateful for Don Chapman’s support while he was struggling to recover from an injury that was thought to be career ending. Doug settled in Fort Wayne, Indiana where he played his last hockey and through hockey connections met his wife Lynne. Upon retirement as a player, Doug’s passion for the game turned to coaching and for nineteen years, he has nurtured the development of young hockey players through the high school’s hockey system. He has a distinguished coaching record winning city and state titles with Northside High School. His son, Sean, is among the players he has coached. For the past two years he has served as Head Coach of Team Indiana, a program that brings together the State’s best junior and senior high school players to compete in the Chicago Showcase, a recruitment forum for universities and junior clubs throughout North America. Doug is proud of his Grande Prairie roots and pays tribute to coaches that helped him develop, not only as a hockey player but as a person. He attributes his coaching success to the mentoring and guidance of coaches throughout his playing career.